This week we watched a wonderful hour-long show "Owl Power" on PBS. It was one of those stories where a dedicated couple, Brits by the way, are truly bird-whisperers who live among a number of falcons, eagles, hawks, etc. in the countryside and engage in lots of education and research. This show focused on two barn owls they raised from the moment they hatched to the time they flew away to be independent. Along the way they helped researchers study and try to understand better the amazing "super powers" of owls: sight, hearing and flight to name the major ones. We have owls in our woods occasionally and we can hear them in the early mornings, especially. 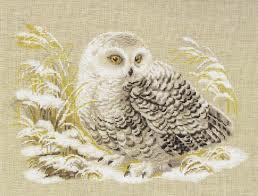 This month's magazine, Birds & Blooms has an owl on its cover and my own entry into the coming year's art show is this beauty...a snowy owl in cross stitch. Guess who's coming for dinner!